Discussion in 'Modified 1991-1994 Explorers' started by TxCowgirlInCo, July 16, 2018. Ok, I've got a question for all those well versed in the TTB especially lifted ones. Initially the 2nd previous owner installed the 5.5" Superlift incorrectly I believe bc the Axle pivot bolts were placed in the upper of two holes in the new drop brackets. Realizing this appeared to be incorrect, the AP bolts were moved to the lower holes and that's when things got very weird. The truck must have been run in the upper holes for a long time (PO had the truck several years) bc it was not happy with axle pivots placed in bottom holes, even if that was where they should have been in the first place. Things I noticed following their 'drop' to the bottom holes. - Tires pushed outward away from vehicle center. 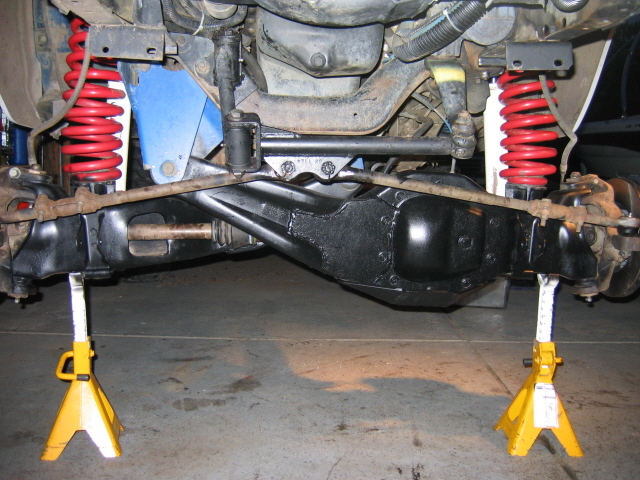 Springs no longer close to perpendicular with frame rails. - radius arm bushings blowing up and even all metal RA locking nuts loosening themselves rapidly even though torqued to spec, Even after new AP bushings put in as well. This is just what I can remember off the top of my head. But what on earth is going on? I've got people coming at me with all sorts of theories or saying I'm imagining the problems but I'm certainly not and therefore wanted to see what you guys, the experts, thought. Thanks a million! Pictures would help a great deal because its quite possible the upper holes were working fine as long as the front end was able to be aligned. Pictures will show us what is going on in that front TTB setup. Does it have stock steering? Are those Superlift 5.5 coils? Which superlift radius arms (there are like 3 updates)? 410Fortune- thanks a million for your quick response! I ended up using the Moog adjustable camber bushings that go up to 2.25° just for sh!+s--grins to see if it was correctable and it was still at least 1.5° negative cambered. They are the superlift 5.5" coils and I think the arms are the 2nd 'generation' as they've got the heavier duty steel plating over the tabs that go over the I beam from the radius arm...I honestly wasn't aware there was a 3 generation of them (more to look into, thx) but I know for sure they're not the 1st edition bc the other 4dr 1st Gen I've got has the 1st edition and uggh those poor tabs!! Here's where it gets particularly odd. Over a short period of time getting driven a bit (my baby the sport is down for engine / trans misalignment) strange things started happening. For instance I noticed one day the steering angle had changed from not so great to damn near perfect but yet it had more bump / thrust steer - nothing was changed on the truck. The Axle pivot bushings blew up as did another set of Moog RA bushings and the RA locknuts still wouldn't stay tight (sometimes tightening/torquing 2-3 times in 15 miles) . It then sat and was only driven once in a blue moon but all of a sudden after giving it a good pressure wash, I noticed extreme signs of metal fatigue / stress corrosion & pitting anywhere the frame or suspension would be under stress during cyclic vibrations and especially flexing out. I mean it went from a little body rust in the rear kick panel and powder coated unders to massive corrosive rust with scaling and flaking only in high stress areas (coil buckets, RA brackets, crossmembers, body to frame mounting). Distorted rivets on the main engine crossmember (underside against frame rail) appeared and the once tight AP bracket bolts were clearly moving around and wallering out their holes. It appeared as of the metal around the huck rivets was encountering friction almost as if the crossmember was moving kinda but the rivets going through the shock towers appeared & sounded good & solid. The tcase skid and trans crossmember were clearly twisting back and forth and also had to be tightened regularly. The leaves have really begun to get weak much more rapidly than one would expect and I'm sure it's beginning to get axle wrap back now as the DS angle is off stressing out the pinion crush sleeve and it's mangled the front ujoint on the rear shaft twice in less than 500 total miles. OH I completely forgot to mention this one has a darned 3" body lift I've not had the chance to take off. It honestly seems as if the change in steering geometry, alignment & axle position combined with the body lift has caused this truck to literally start tearing itself apart but only since the AP were dropped. I'll work on uploading some pics shortly as well as attaching a Ford TSB I came across during my research. Thanks again!!! I installed a used 5.5 lift on an explorer about a year ago and ended up using the top holes because I couldn't get the alignment right at the bottom holes because the springs were sagged. Even installed the crazy up to 4* moog bushings. We decided to add f150 spring spacers and then we're able to get an easy alignment on the bottom holes. All in all the 5.5 spring tend to sag to close to 4.5 from what I have seen. Thank you Boomin! Yeah these TTB's can certainly be the finicky creature for sure. Think we all make the mistakes the first go round of not appropriately babying them and send up blowing bearings & bushings like mad until we get better educated. Not being a quitter and a lot stubborn i didn't give up after the first one lol. His front end is perfect..now lol. And I guess I'm a glutton for punishment bc there's now 3 first gens and 1 - 2nd Gen that I call kids lol. How's your ex now? Still happy with your setup? Weren't the bottom holes for the 8" lift? I have never really liked the 5-8" drop bracket lifts, the drop brackets just are so tall! If it ain't broke, don't try to fix it! My camber shims are stock with 1/2 degree of correction. 8" of lift???? Now you've got me wondering and wanting to go check product descriptions lol. Having not actually sourced one is the lifts new I couldn't swear one way or another.
] did you cut and turn them yourself or send the beams out? Thanks! we built our own beams, still have the jigs and templates too! Really? That’s amazing! How long ago was that. Can I PM you and pick your brain a little bit more? Only mod needed was a custom axle shaft, dana 44 shaft we had cut to length and re splined. Another possible option may be to pick up cut/turned beams from BTF Frabrication. They do the cut/turn by moving the lower balljoint out. It's the cut/turn beam I've been using.